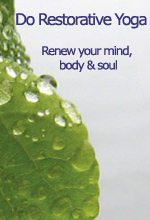 Do Restorative Yoga is dedicated to creating, collecting, and sharing knowledge of Restorative Yoga, Deep Relaxation, Yoga Nidra, Meditation, Yin Yoga, Somatics, and other Therapeutic styles of yoga. Images, videos and descriptive text make this site accessible and interesting. Visit the website, blog, or facebook page for more information. 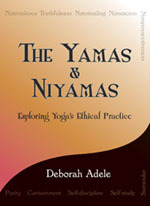 The Yamas & Niyamas, written by Deborah Adele, explores Yoga's ethical practice, the foundation of skillful living. These 10 yogic guidelines free you to take ownership of your life and direct it towards the fulfillment you seek. Gaining the skills to choose attitude, thought and action may be the grandest adventure you can take. Click the book's cover image for more information.